Country Bliss: Whoops, it's the end of January already! Whoops, it's the end of January already! 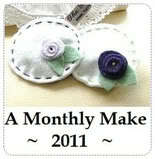 I've joined Annie the felt fairy's challenge to do a make a month during 2011. As I normally make things for others I'm going to take this opportunity to make some things for myself & cross some things off my want to make list. So in January I have crocheted a mini flower wreath. I've also crocheted a face scrubbie & a dishcloth in 100% cotton to try out before making some for my stall. If you head over to Annie's blog using the link above I do believe you'll find a list of other participants & I'm going to crack on with February's makes as after all it's a short month, maybe something heart themed I think. wow you've had a really productive month. I really like the crochet mini wreath, really sweet. Wow you have been busy this month. I love the flower wreath. Well done. Looking forward to seeing what you make next month. Gorgeous makes, I particularly love your flower wreath! I love your flower wreath too! Your projects look absolutely marvy. I love the wreath especially. Oh I love the little flower wreath, how pretty! I am currently addicted to crocheting dishcloths, can't beat 'em!